Manish talks about the LMI (Last Mile Idea) which brings a smile on the customer’s face. [Last Mile Story 1, Last Mile Story 2] At the end he mentions a mental note to keep collecting such experiences. 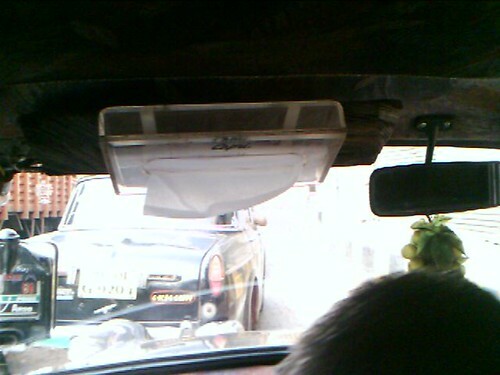 So the other day while I was travelling to the suburb in a taxi I happened to see this very useful thing fitted in the taxi. It’s a handy tissue box to wipe off the sweat which the Mumbai heat gives you. Thinking aloud: I was wondering if it would be nice for the taxis of Mumbai to be fitted with such customer friendly services like – maybe newspapers, water bottles, mobile chargers and things you like to have when travelling long distance. (Read: Office commuters returning back home from South Bombay back to the suburbs). Of course it would increase the cost, but then would you not pay 5 bucks more if your taxi driver provided you with a bottle of water when stuck on the western express highway during rush hour. Next Post Keep Mumbai Clean: But how?